I will miss my friends who are still in DC. I’ll miss free museums. I’ll miss Teddy Roosevelt Island, the woman who works at the amazing little Indian Place near the Crystal City water treatment place and the bus depot, and having a local Vietnamese shopping center. And a few places I still haven’t told you about. The pizza above is from 2Amys, a neat little Neapolitan pizzeria near the National Cathedral. It’s a homey place with a wood burning oven and a great menu. 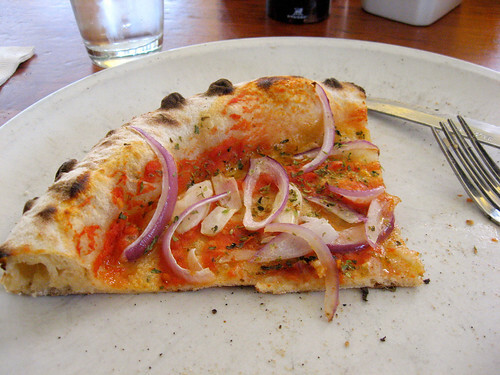 Pictured is the Marinara (no cheese!) with onions added. The onions weren’t my favorite add-on, I have to admit. Far better is the eggplant confit, or pairing a fatty meat like the pancetta with arugula (the fat acts like a salad dressing, as it basically looks like someone tripped and put a salad on top of your pizza!). It can get busy, and it’s popular with families. But the out-of-the-way (read: no close metro stop) location means you’re somewhat less likely to be sandwiched between piles of obnoxious tourists. I’ll take local crabby urchins over exhausted grumpy tourist tykes any day of the week. Their other bits are great too, from the Suppli a telefono (breaded and fried little balls of risotto-ey goodness) to the Potato and Prosciutto Croquettes. While I thought the “stuffed pizze” (think calzones) had a bit too much ricotta, it might just be how easily I’m overwhelmed with dairy. The Bruschetta is somewhat disappointingly really just… bread. Really good bread, but not what I expected for $6. Many thanks to my think-tank Evil Twin for introducing me to this place (we’re both the evil one, born on the same day, both went to Smith, both lived on Green Street). Switching continents, we come to one of the highlights of the Virginia portion of the Orange Line- Peruvian Chicken places. There are a couple places near Virginia Square, and then there’s the place that used to be very close to Balston Station that’s now… a longer walk. (There are also places up and down the Rt 7 area, and supposedly some in DC and Maryland). They primarily serve chicken. Charcoal rotisserie roasted with a blend of herb and spice I can’t even begin to recreate well. The one Anthony Bourdain went to on the DC No Reservations episode is on a side street across the street from George Mason Law, and quite convenient. Only, your only two options for sides are fries and coleslaw. And usually when we went in, we got a faintly Imperialistic vibe, as the whitest guy there bossed around the nicer- and darker- individuals. We usually went to the one near the Balston mall, and followed it down Wilson Blvd when construction closed the one we’d been going to (it’s somewhat unclear if this location was new, or had been there the whole time). 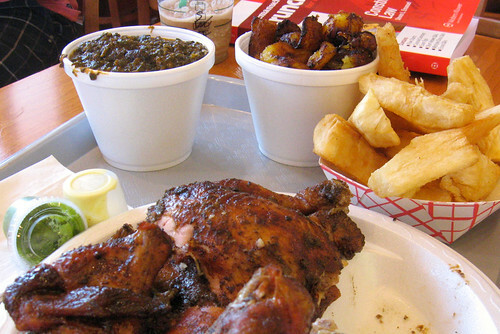 They have a lot more sides, our favorites being yucca, spinach, and plantains (pictured), as well as rice, chickpeas, fries, onion salad, and a bunch of others. They even have things other than just chicken– the Carne Asada’s pretty good too. We’d get a whole chicken, eat somewhat less than half of it, and then remake the rest of the chicken into pot pie or enchiladas or something. I’ll also miss Tyler Cowen’s Ethnic Food Guide. While there were a few situations in which his advice wasn’t very useful– I’m sorry, I just don’t like Ethiopian. Call it a failing if you will, it’s just not our thing– We could count on his advice to at least find the better versions of any particular cuisine, and the better places in whichever area we happened to find ourselves in. His advice was always useful and relevant, and while there are a lot of great blogs in the Boston area, I doubt there’s such an exhaustive list as Cowen’s one page html guide. We’re now back in Boston. Ish. Finding a place to stay, finding a job… and revisiting favorite Bostoney locations. Next time you come visit DC, check out Crisp and Juicy for their chicken. I can’t say for certain, but I think they started the trend, and even if they didn’t its been my favorite for years. They’ve got several locations by now: Falls Church and Lee Highway as well as Tenley Circle are the ones I know of, but I keep seeing more around town. Oh, Dickon, I want it all to be wick!